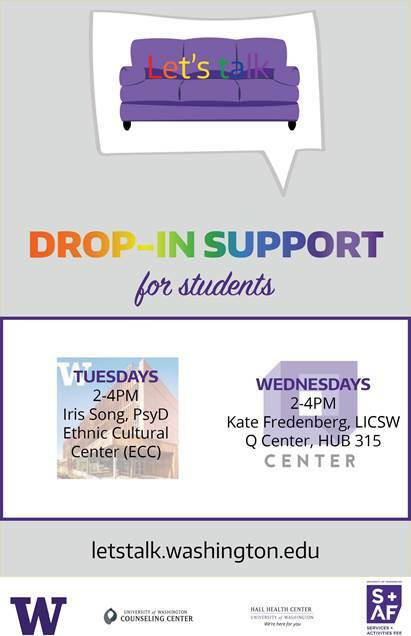 Here are the drop-in mental health resources for spring quarter. These are FREE resources available for students. No appointments necessary. Students can just show up. More information and flyers available via hyperlink. o Mindfulness meditation is a practice that helps reduce stress, anxiety and depression by cultivating greater self-awareness and a sense of inner peace. · Mental Health for the People workshop with Andrea Salazar on Friday 6/1 at 3pm in 401 Schmitz Hall. This is a new quarterly workshop series is focused on mental health topics from a social justice perspective. The topic for spring quarter is The Impact of Colorism on Communities of Color. o Offered during the 10 weeks of each quarter. To protect the confidentiality of our clients, Counseling Center staff will not discuss personal information by e-mail with clients or with others. E-mail may reach unintended audiences through forwarding, address errors, or disclosure as public records. Clients are urged to limit e-mails to the Center to scheduling issues, and to contact us by phone or in person for other matters. Please also be aware that I do not maintain 24 hour access to e-mail accounts, and e-mail is only checked intermittently during business hours.